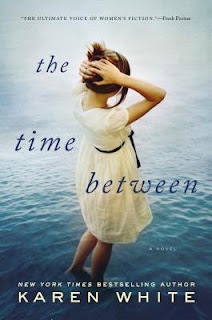 The Time Between is my first Karen White novel and I really enjoyed it. From the characters to the story to the atmosphere, I thought this novel was a well written, intriguing read about family and the damage guilt and secrets can do. You can’t help but sympathize with Eleanor. We are informed of her plight right away and guilt is holding her back. It is also holding back those around her doing the guilting. Rooting for Eleanor comes easily, and it wasn’t long before I was eager for her to move on, to succeed, and to get back to her passion. It takes her boss to nudge her out of her routine, and his curmudgeonly old aunt, Helena, for her to begin to crawl out of her shell. The comfort zone she had hid in for so long is no longer an option in Helena’s sprawling old home. That the house resides in the town Eleanor grew up in, brings back memories, and loosens her up even more. I particularly loved the banter between Helena and Eleanor, and enjoyed Helena even though she was crotchety at times. I loved how Eleanor was able to draw her out and vice versa. In fact, I loved all the characters from boss, Finn, to his daughter, precocious and older than her age, Gigi. I loved Finn's relationship with his daughter. Women everywhere will swoon over his character. I did - but what isn't attractive about a man who dotes on, and is completely invested in his daughter's well-being. I loved how each and every character seems to grow in this novel, and even though parts may have been predictable, many were not. The mystery and intrigue in this novel kept me reading as I couldn't wait to find out the secrets Helena had, and what Will was keeping from Eleanor. The writing was excellent and the descriptions were impeccable and just how I like them without boring me, as long-winded descriptive prose tends to do. I did find The Time Between moved too slowly at times for my liking which was evident as I drifted off into space while I read from time to time. I did find I wanted a bit more action. The Time Between is a great summer read, full of summer activities, sweltering nights and even some star gazing. Contemporary women's fiction fans who love a hint of mystery will enjoy this one!